Diana’s Little Corner in the Nutmeg State: Rio Has One. 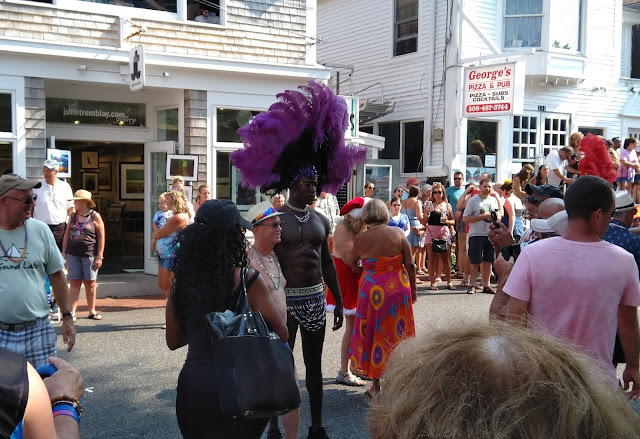 Yesterday I took the bus up to P’town for their Carnival. And I can tell you the bus is the way to go (It is $2 one way and only a $1 for seniors). Cars were parked alongside of Rt. 6A all the way to North Truro and the way home cars were parked on Rt. 6 also to North Truro. I overheard one P’town police officer talking to an Orleans officer (I also saw Truro, Eastham officers and a state police helicopter flying up and down Commercial Street) there that there were around 100,000 people in P’town for the parade! We came down Rt. 6A in to Provincetown and as we crossed into P’town there was a number of floats in the Harbor Hotel parking lot and Commercial St was blocked off to traffic and we drove down Bradford St., then down Stanton on to McMillian Pier where we got off. 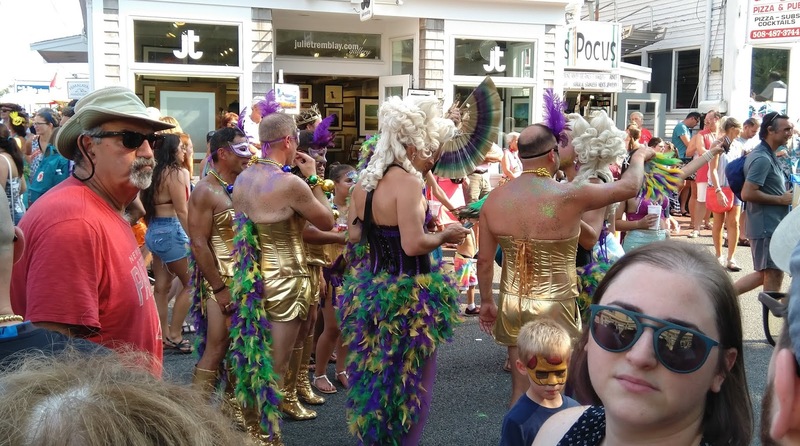 I wound my way through the crowds to in front of the town hall where I stay for over an hour, it was amazing! I never saw P’town so crowded. Our bus was the last one that they allowed t cross Commercial St. and then it was blocked off. 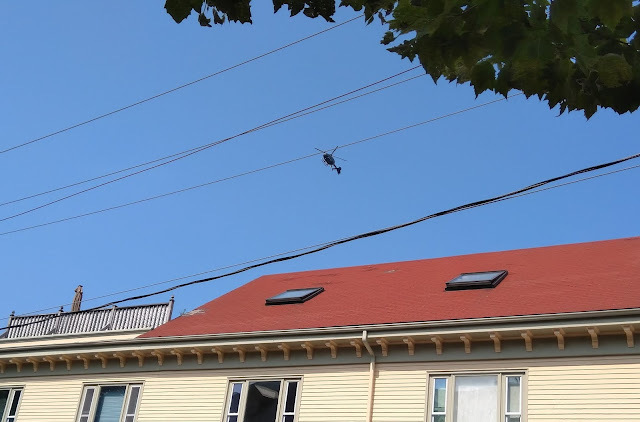 Every once in a while the state police helicopter flew over just above tree top level and a couple of times it hovered over town hall just a couple of hundred feet in the air.. I don’t know if you could call it a parade for the most it was just people scantly costume walking up and down the street, mostly men many of them in drag but there was a few women who were also dressed up. There were lobsters dancing in the street! 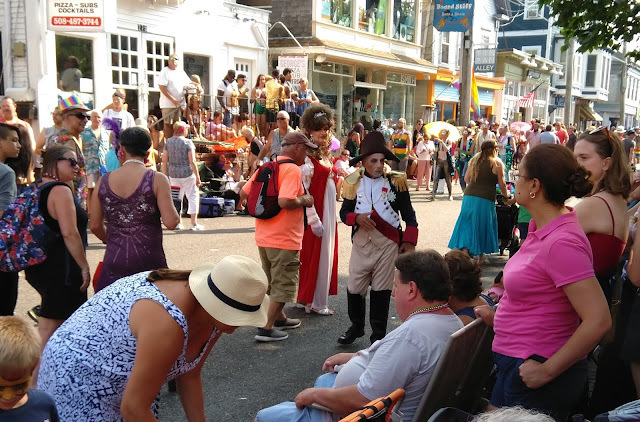 Even Napoleon was there today! As it was getting near five o’clock I wanted to catch my bus back to Wellfleet or I would have to wait until 6 for the next bus and I didn’t want to wait that long. My feet were sore from standing on the road for two hours and it was HOT! But at least it wasn’t humid. 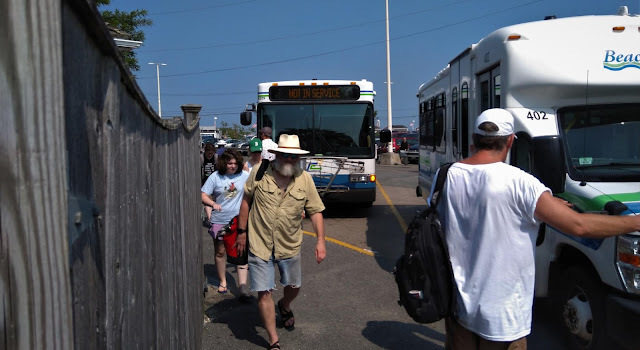 Since the Commercial St. was blocked I asked a couple of cops if they knew where the bus was picking up passengers and they all didn’t know so I went over to the bus stop on the pier. There was a bus stuck there until after the parade so I asked the driver and she told me to go over on Bradford by the Gulf station. I finally made it across Commercial St. since the police were not letting people cross it I started looking for a way across it. There were two old men who I overheard that they were looking for the bus; one of them was in a wheelchair so I told them that the buses were over on Bradford. One of the officers let them cross the street so I started talking to the man pushing the wheelchair like I was with them. So I got to the intersection where the busses were supposed to be and there was about a dozen busses all jammed up and it was a quarter after five… did I miss my bus and would have to wait another hour? I was just standing there kind of dazed and a bus drive leaned out of the bus window and said “Can I help you miss?” I told him that I was looking for the FLEX bus to Wellfleet, he looked out the window up and down the street, he said “There it is!” and I ran toward it. I asked the drive if he was stopping at the Dunkin Donuts in Wellfleet, he said yes and I stuffed my buck in his machine and sat down. No sooner that I sat down and the crowd started coming in and the bus was packed standing room only. The younger people were giving up their seats to the older people which really nice of them; three older women were offered a seat looked at me. I said I am going to be 70 in October. Today is a travel day; I am heading home for a two o’clock meeting so this post has been pre-written on yesterday night.